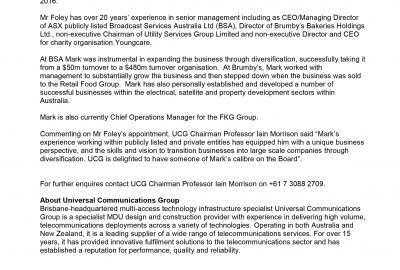 Brisbane-headquartered Universal Communications Group will embark on a major expansion in the New Zealand market, following a 10-year deal with Chorus to connect UFB services in multi-dwelling units. UCG CEO Ralf Luna told CommsDay the company was looking to establish up to three new officesin New Zealand – two in Auckland and one in Wellington.He also noted that he company was planing to hire 150 staff directly and between 20-30 contractors. Luna said that it was hard to put a dollar value on the contract, given it is volume based. “The most important thing for us is that he deal is for 10 years, so it gives us longevity and the opportunity to plan ahead,” he said. Under the non-exclusive agreement UCG will complete work under caped pricing, which is subject to review after six months or the connection of 1,00 multi-dwelling units. The contract wil start from July 1. There are approximately 37,00 MDU and terraced premises in Auckland and Wellington, encompassing about 130,00 end users, that may be covered by UCG under the contract subject to UFB uptake. UCG is regarded as a specialist in providing connections to multi-dwelling units across a variety of technologies. The company was a major participant in the rollout of HFC for Foxtel and Optus and has also been a key partner for NBN Co in the roll out of MDUs. In late 2012 it was awarded a $21 million contract with NBN Co to connect flats and units in metropolitan Sydney and Tasmania to the NBN, and had previously done the MDU connections for the first release NBN sites. 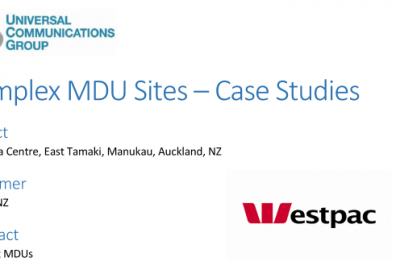 Chorus had previously relied on service companies in Auckland and Wellington for MDU work under an interim service agreement since the beginning of this year. The deal with UCG will see those companies focus resources on the increasing workloads on the rest of the UFB rollout, according to Ed Beattie, GM of infrastructure at Chorus. Luna told CommsDay that skills development would be another key focus for the company, both in Australia and New Zealand. “It’s always hard to get skilled workers but we have an existing pool of resources and will up-skill new entrants into the industry,” he said. “We are looking forward to bringing our experience and know-how to New Zealand and engaging a skilled local workforce to met he highest standard of delivery for Chorus,” he adfed.